Yesterday Rhys Williams and Gareth Warburton (Welsh athletes) were handed four and six month bans respectively having failed drugs tests just prior to the Commonwealth Games last year. The UK Anti Doping web site, announcing the decision, said ““These cases send a powerful reminder to athletes that there is no guarantee that any supplement product is free from banned substances”. Warburton failed a test for metabolites of at least two ‘designer anabolic steroids’ which could, if abused, provide modest increases in muscle mass and recovery. None of the possibly related steroids are produced naturally by the body. Williams had one of the same metabolites in his urine sample. They were both taking the same nutritional supplements. Before the hearing the athletes had these supplements analysed to determine if they had been contaminated. The World Anti Doping Agency Code says that if a person can prove their doping positive came from a contaminated supplement then the suspension can be reduced from 2 years, possibly to 0 depending on the degree of fault the panel decide the athlete must shoulder. Following analysis the supplements were found to be contaminated with two anabolic agents, methyltestosterone and estra-4,9-dien-3,17-one (consistent with the metabolites detected in the urine samples). The athletes were deemed to have been partially at fault for not having the supplements checked by any official medical support staff. Is is guilty as an athlete has committed an offence if they are found to have a substance in their urine (strict liability – see below). In an interview with the BBC Rhys Williams protested his innocence, saying he is in fact the victim and should have been exonerated. As he said ‘the only thing I would have done different is not taken a supplement‘. Essentially if an athlete fails a test it is an offence and they must provide evidence that they are innocent, rather than WADA (or UKAD etc) having to prove how the drug got there. As a toxicologist I would look at the results of such testing and try and interpret them. This is problematic when a single point urine sample is used. I have seen mentioned ‘there was only a nano whatsit amount’ in the urine sample in this case, whilst others suggest the level detected in the urine can aid in determining the amount of the substance used. This is good thinking but unfortunately the logic doesn’t hold up. There is actually no way to determine the route or the amount of a drug taken from a single urine sample. In the graph below I have tried to illustrate this. On the y axis (upwards) we have nano whatsits in urine (for the scientists lets call them nanograms per millilitre of urine, or ng/mL) and on the x axis we have time after being taken (assume the drug is consumed at time 0). 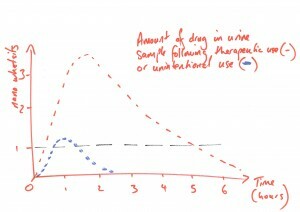 The red dotted line shows the concentration in urine following the use of a normal pill containing a therapeutic amount of a drug, whilst the blue dotted line shows a dose relating to that from a contaminated supplement. As you can see the level reached by a therapeutic dose is likely to be much higher than that of the contaminated supplement. If the level in the urine sample of an athlete is 1 ng/mL (indicated by the dotted black line) then it can be seen that that level could be gained on the way up or on the way down, 30 minutes after having taken the contaminated supplement, or again an hour or two later. As can also be seen though, the same nano level can be reached through therapeutic use of a drug shortly after use or again many hours after it was used. (In the graph above I have not used actual data but an approximation of an average drug). The use of supplements is a little akin to Russian roulette for the high level athlete. There are no guarantees that the supplement you chose will be drug free and even one trusted supplement can have a difference from one batch to another, The contents may change or the proportions in them may change, and even if you are checking the label for the names they may be listed in different ways. For example the substance that has probably caused more positive tests through supplements than any others over the past few years DMAA, has been listed as any of ‘2-Amino-4-methylhexane, Dimethylamylamine, 1,3-Dimethylamylamine, 1,3-Dimethylpentylamine, 4-Methyl-2-hexanamine, 4-Methyl-2-hexylamine, methylhexamine, geranamine or geranium extract’. Confusing. There is a programme called Informed Sport that tests supplements and ceritfies them, if you want to take a supplement and compete then this should be the minimum level of precaution taken. So are they guilty – I would guess they are entirely telling the truth. They feel they have been cheated out of competing at the Commonwealth Games and have lost out a seasons worth of titles and endorsements, hard to take in a short athletics career. Will they take supplements again? I wouldn’t bet against it….